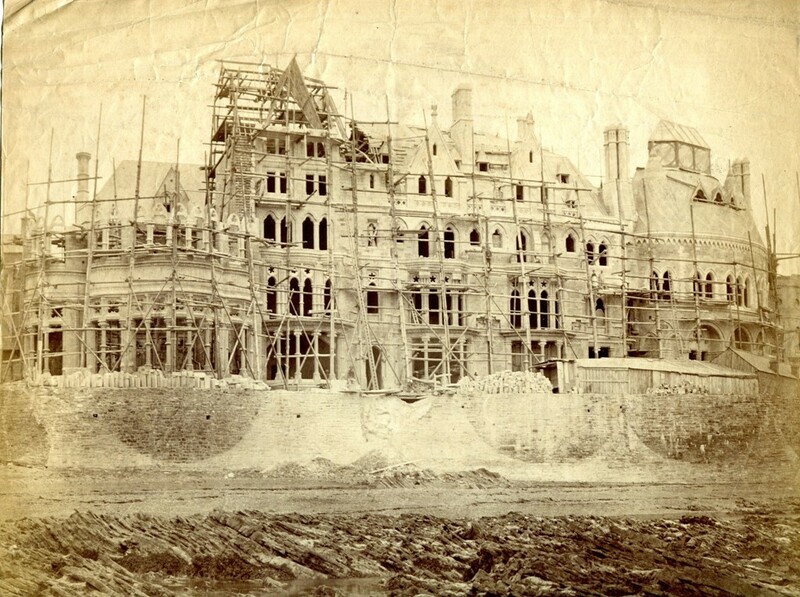 In November I wrote about the Old College, Aberystwyth, and an early photograph showing the construction of the main hotel entrance on King Street in 1864. 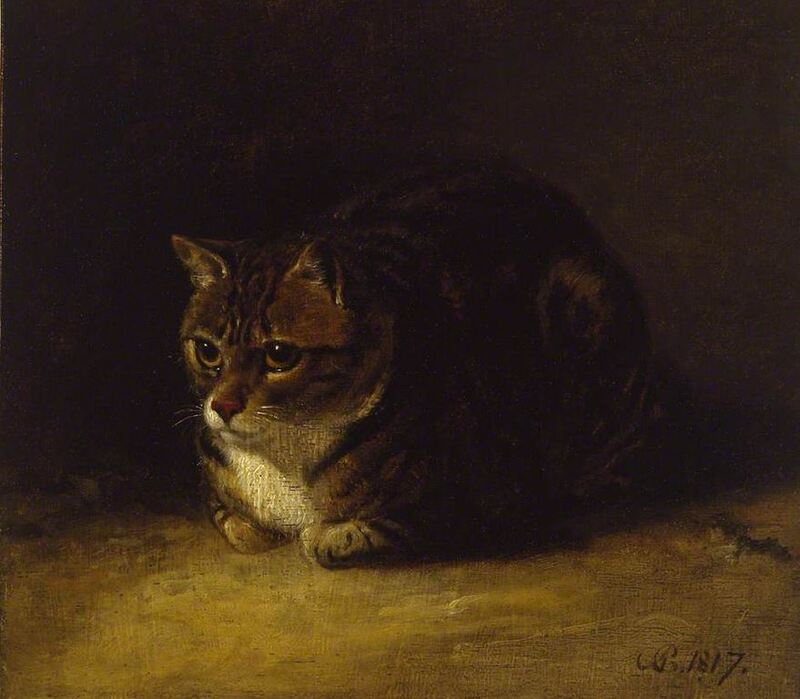 Now further researches in the archive of the Clarkes of Llandaff by Mike Statham have brought a further early picture to light, and this one, I think, may be less well known. 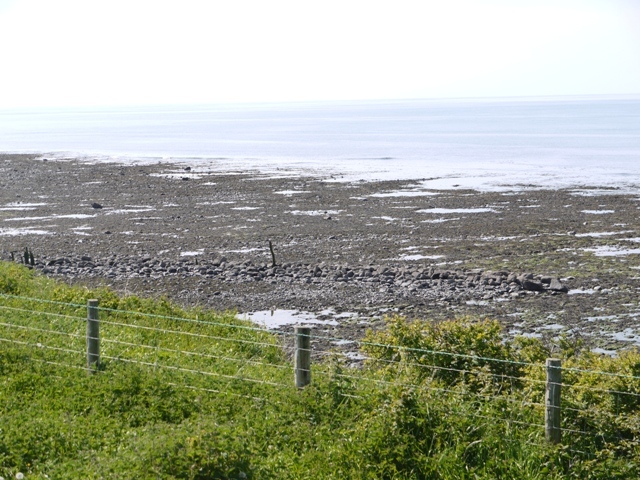 The view is from the shore and shows the sea wall still under construction and topped by builders’ sheds. Wooden scaffolds cover the entire facade, and the progress of the build seems to have been from south to north. Immediately beside the old Nash dwelling Castle House, (just visible at the right of this picture) we see the oval front of Seddon’s large seaward facing bar, which is now known as the Seddon Room. Above it on the first floor, and approached, by gentlemen only, up a separate stair, were the smoking room which overlooked Laura Place and the billiard room overlooking the sea. In this picture, the billiard room construction looks almost compete, its roof pierced by three small dormers, and topped by a glazed rectangular ceiling light looking very much like a huge wardian case. These details are true to Savin and Seddon’s original ambitious design for the hotel. The Billiard room was 48 feet by 24 feet and was to accommodate three full sized billiard tables and many spectators. Further north the build looks confusing. Two gables have been competed in line with Seddon’s original plans, but the third, taller gable appears partly constructed, and the distinctive ornamental hexagonal chimney beside it seems not yet to have been built. There seems instead to be a hole in the roof where it will later stand. To the north end, the first floor of the building has only reached the tops of its gothic arched windows, and so it seems to have remained for many years. It was incomplete at the time of the bankruptcy of the hotel and remained so during the first phase of Seddon’s alterations to the building for College use. The fire in the Chemistry lab, on 9 July 1885 which extended to gut the whole of the north wing, is recorded in a photograph after the disaster. The grand billiard room roof is gone, as are the three gables of roof adjoining it. On the left we see that the build at the north end has still, after 20 years, not progressed above the first floor, and remains a shell, just as it appeared in 1865. The repairs and rebuilding of the College after the fire were directed by Seddon but saw many economies and alterations in the roofscape. In 1894 a different architect Charles J Ferguson, with far less gothic leanings, was employed by the college, and was responsible for the much plainer central block, and for the solid and very slightly Queen Anne-style Alexandra Hall at the far end of the promenade. 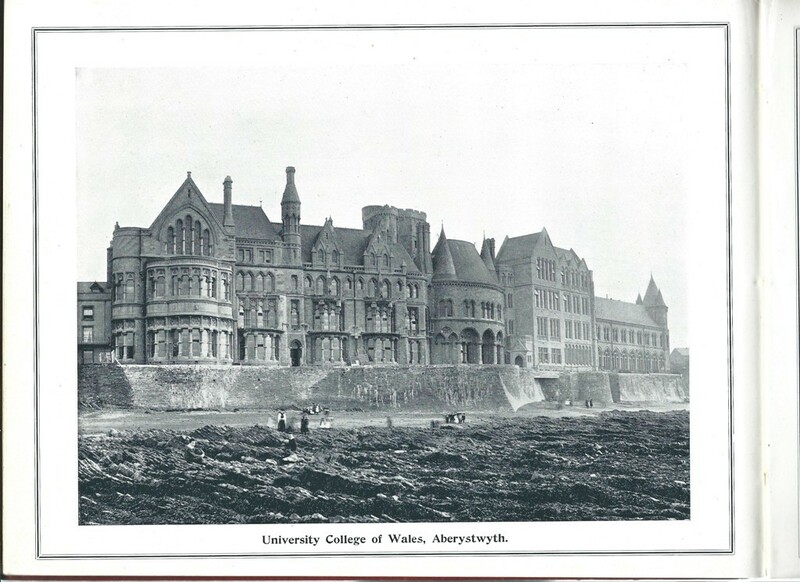 The resulting apppearance of the Old College in the early 20th century is seen below, in an illustration in one of the many volumes of Photographic Albums of Aberystwyth and District which were produced annually by The Cambrian News, to meet tourist demand. An old photograph showing the building of The Castle Hotel, now the Old College, Aberystwyth, recently came to my attention. 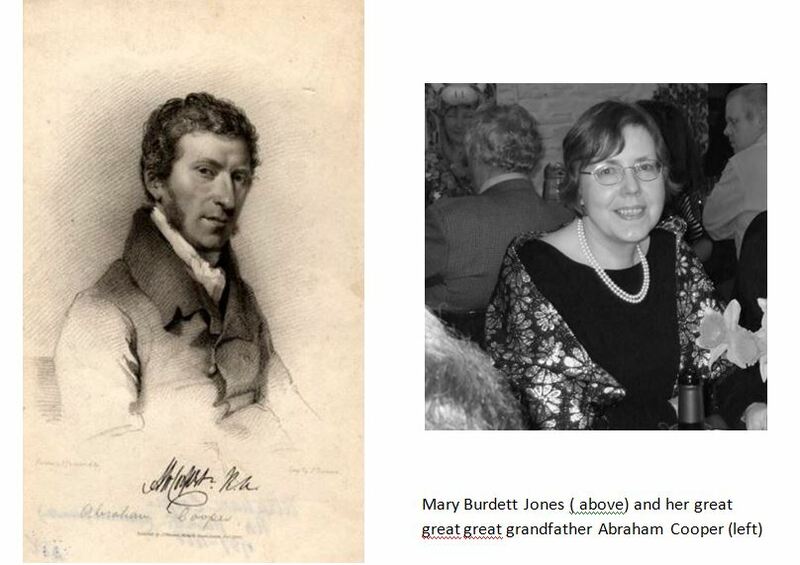 MichaeI Statham, an indefatigable quester among archives, found it in the archive held by William Michael Clarke a civil engineer and the fifth generation descendent of the Llandaff mason who worked on Thomas Savin’s short-lived Castle Hotel at Aberystwyth. 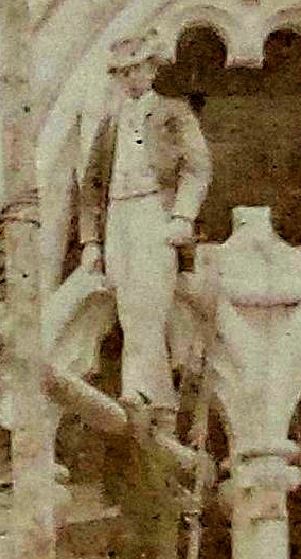 I am told that Edward Clarke mason/sculptor was active 1835 to 1878. He was followed in the business by William Clarke (active 1871 – 1915 mason/sculptor) then Thomas Guy Clarke (active c1900 – 1942 quantity surveyor and designer) then another William Clarke (builder) and now William Michael Clarke (civil engineer) who is the last in line – the firm will cease to exist when he retires.The archive also contains photos dating from Edward Clarke’s time of Llandaff cathedral and of Ettington Park, Warwickshire. 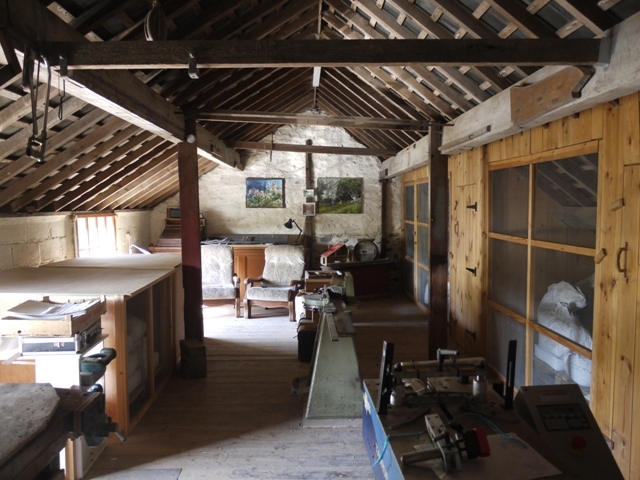 Clarke worked with Llandaff architect John Pritchard on both, and J.P. Seddon was, at the time Prichard’s partner. 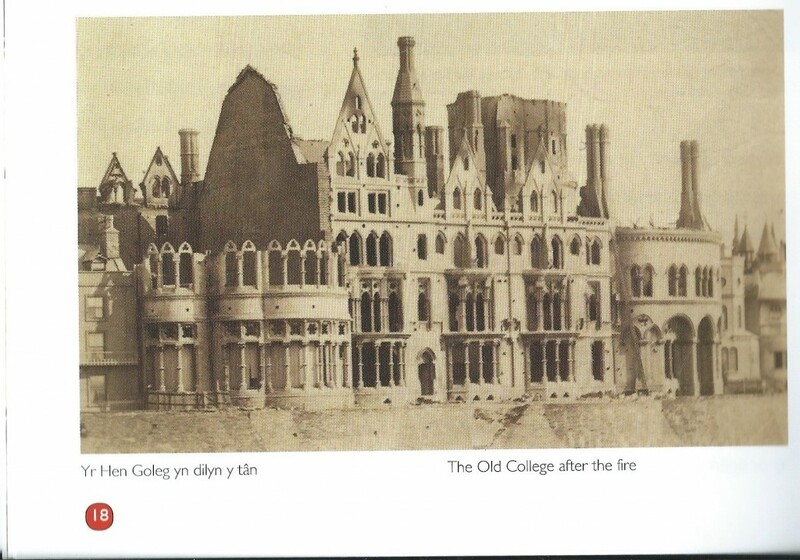 I find that the Aberystwyth photo is already well known, an identical copy existing in Aberystwyth University Archive and reproduced in a recent pamphlet Yr Hen Goleg/The Old College by Elgan Philip Davies (Gomer 2011). In it Davies writes that the haste with which the building was being constructed, by 500 men directed by the architect J.P. Seddon, meant that form of the port cochere or carriage porch was the result of builder’s initiative as there were no plans available when they commenced work. J.R. Webster, in his book Old College Aberystwyth (University of Wales Press 1995) however states that the unusual triangular footprint of the porch was adapted by Seddon, whose initial plan was to more or less reproduce the four square porch he had built at Ettington Park. In either case, Clarke and Seddon had common experience of the Ettington build,and there was doubtless scope for creativity by Edward Clarke. The existence of this old photo in his archive perhaps reflects the pride which all took in this ornate entrance. 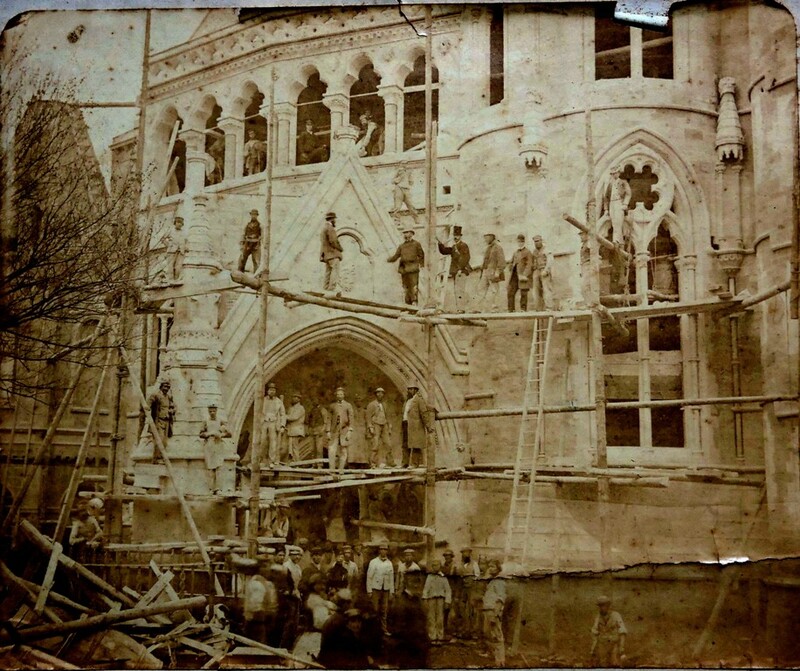 Close scrutiny of the picture reveals the precarious nature of the timber scaffolding of the day and the presence of at least three gentlemen whose clothing depicts their higher status. It is pleasing to guess that the two top hatted gentlemen on the upper and lower platforms might have been J.P. Seddon the architect and Thomas Savin the entrepreneur who bankrolled the hotel. 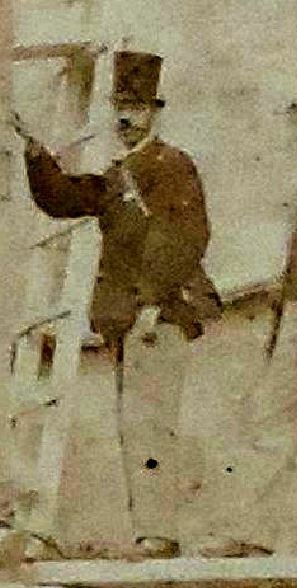 But there is another figure, a decidedly dandified young man in pale trousers and waistcoat, balancing on a single pole to the right hand side of the picture. 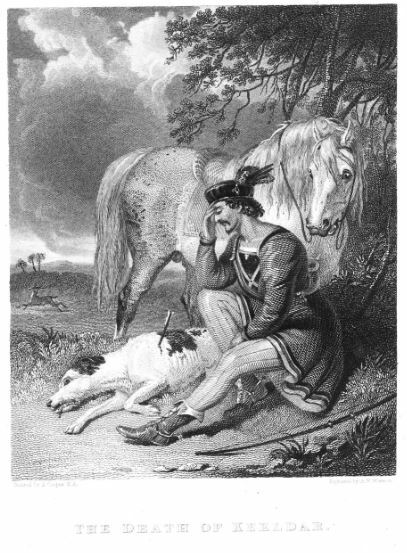 Who I wonder was he? Could this be Thomas Savin? Could this be J.P. Seddon? And who is this elegant young man? The Castle Hotel opened for business in June 1865 still unfinished, and closed a year later due to insolvency. 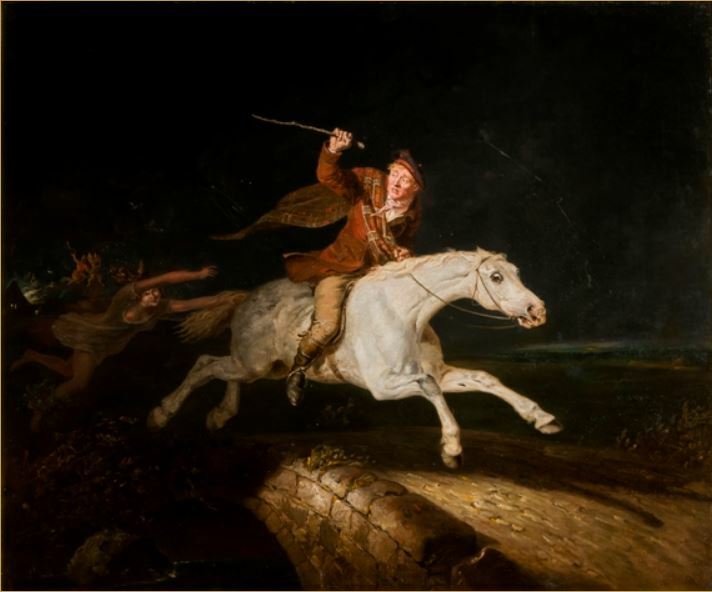 It was then acquired for £10,000 in 1867 to house the University College of Wales. Today it is somewhat forlorn, the University staff occupants have largely fled, relocated to the main campus on the hill and ambitious proposals are being discussed for its future refurbishment and use. But its massive ornate bulk is one of the defining features of the town and for many, a symbol of the pioneering beginning of University education in Wales. The day started well, the weather was dry and it being a Monday I thought I’d do a few long overdue errands in the town. Not that it’s that bustling these days. The last few weeks have seen the disappearance of two more retail opportunities, Millets has closed down and gone, and Monsoon – which along with New Look and Dorothy Perkins used to constitute the Aberystwyth window on current high street fashion, has quietly transformed itself into an Accessorize. Presumably the depleted town is more likely to buy scarves and earrings than to actually choose an entire outfit. First stop was the bank (funnily enough we still have lots of those). I pulled into part of the extensive empty space in Stryd y Popty to run down to the cashpoint. The parking sign allowed 30 minutes parking after 1pm. The time was 12.35pm. And the 60 seconds I was away was sufficient time for one of the numerous traffic wardens to appear. I suppose it was really nice of him to just give me a polite telling off for infringing the law so briefly in an empty road. But my morning dis-improved. I confessed to him that, having got the money, it was my ambition to take a bundle of curtains from my car into the dry cleaners 30 yards away before driving off. But no, he wasn’t as nice as to allow that. I eventually walked from a legitimate spot to the drycleaners, bearing a pair of heavy cotton William Morris print curtains. I knew they were the real deal. I bought the material myself nearly 30 years ago in a very upmarket curtain shop and sewed them, fully lined, myself. But what was I thinking of all those years ago? No fabric care label! I had gone hoping to be advised by the professionals – wash or dry clean? What would they recommend for traditional cotton? What do other people do? (obviously they clean their curtains more often than I do for a start!) But the young assistant only wanted to know whether I had an International Care Label, and it not being present recited a warning that my curtains might shrink, run, or stain during cleaning. Not only did I have to pay in advance but sign a disclaimer taking full responsibility for any such disaster. What was missing though, and would have been welcome, was the professional opinion of someone in the dry cleaning trade. But he wasn’t as forthcoming as that. So after spending a good four minutes in my legal one hour parking spot under they eye of the roaming wardens I set off for Morrisons supermarket. Here one can park without hindrance. I completed my shopping and queued at the till behind a newly delivered mother and her 10 day old baby. The child was sleeping determinedly in a bucket shaped car seat balanced at the top of a huge supermarket trolley. Mother had come prepared, her body wrapped in a baby sling into which she could transfer the child if it fretted. She looked as if she was laying in supplies for a fortnight. Quite possibly it was some considerable distance to her rural home. She also looked tired. Any woman who can shop with such efficiency with her new baby gets my respect. And everything went fine until the check out operator reached her two little packets of 16 paracetamol and two little packets of 16 ibuprufen. And here the operator nicely explained to the the purchaser of some £200 worth of food and household necessities that she wasn’t allowed to buy more than one packet, worth just pence, of each! There is many a newly delivered mother who is advised by her midwife to take these two medicines while she recovers from the birth and its attendant aches and pains. But store policy takes precedence over customer convenience. The young woman accepted the confiscation without argument and departed with her meagre supply. She will have to go out shopping again sooner than she planned. In each of these interactions a politely robotic employee has been trained to thwart the customer by performing their duties without a trace of helpfulness or empathy. Not a heart warming experience. 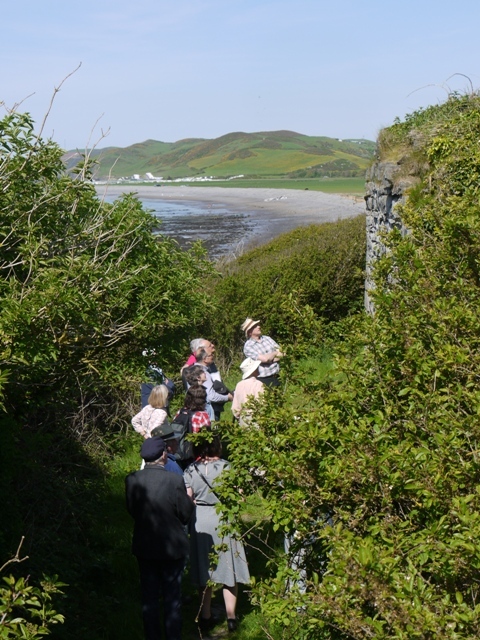 Plants, mainly grasses, have been being selected and improved at Aberystwyth for almost a hundred years. 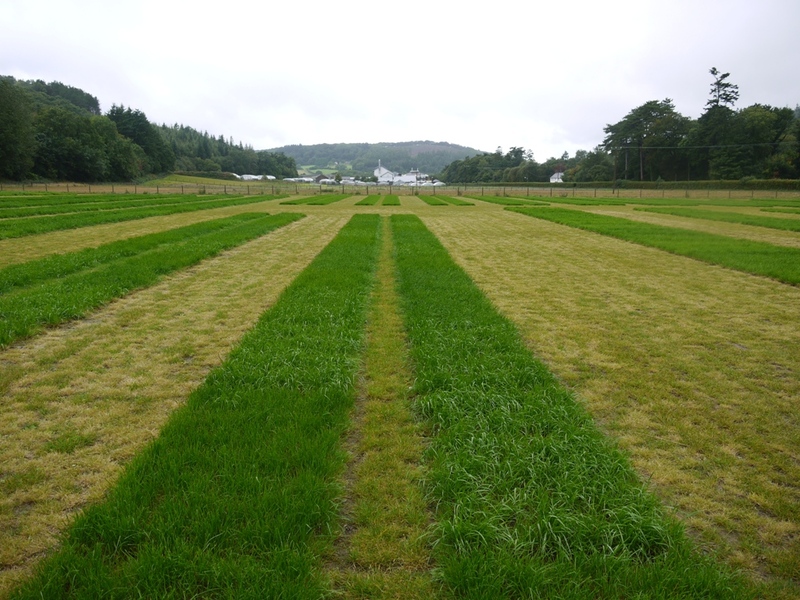 Modern experimental oat breeding, for example, began here in 1919 along with experiments designed to improve the properties of forage grasses for sheep and cattle. In those bygone days the research organisation was called the Welsh Plant Breeding Station (WPBS) and it was directed from 1919 to1942 by George Stapledon, who was duly knighted for his endeavours towards achieving what we now call ‘Sustainability and Food Security’. In those days it was called ‘Autarky’. In the Seventies we called it ‘Self-Sufficiency’. (In any case, all these terms mean producing more, with less dependence on imports and political alliances). I recently saw some charming photos of the early days of plant breeding at Aberystwyth. Airy greenhouses contained bevies of women in pretty dresses, meticulously stripping the male parts (the anthers) from oats or other grasses and pollinating the stigmas with paintbrushes loaded with the chosen pollen. Over the years the Welsh Plant Breeding Station grew in size and importance, moving in 1953 to the Gogerddan estate, of one of the former great mansions of Ceredigion, at Penrhyncoch. The Queen came to open the new establishment. The former walled garden of the estate soon disappeared under a complex of modern buildings. In the 1990s after various mergers WPBS renamed itself the Institute of Grassland and Environmental Research (IGER) and then to the bewilderment of many, mutated once more, by merger with Rural and Biological Sciences at Aberystwyth University into IBERS (The Institute of Biological, Environmental and Rural Sciences). Many still know it by its older acronymns, especially the large local workforce who since its inception found employment in its glasshouses, fields and experimental plots. Today IGER oats account for 65% of the oats planted in Britain and IGER varieties of rye-grass are contentedly masticated all over the world. IGER turf has been developed for the particular needs of different sporting venues, and even to grow on vertical surfaces to enrobe green sculptures. Meanwhile the sophistication of genetic engineering moved on from the days of girls in pretty dresses and now involves the scrutiny not just of new hybrids but of individual genes. 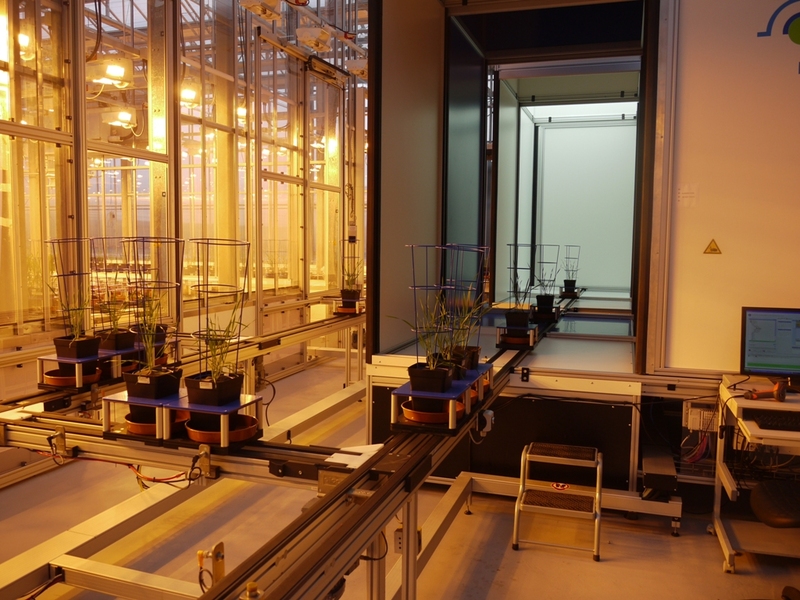 And to mark the twenty-first century IBERS has a startling new toy, The National Plant Phenomics Centre, one of the most advanced experimental greenhouses in the world. In the National Plant Phenomics Centre glasshouse, plants leave the artificial sunlight for a visit to the measuring chambers. Here in a giant brightly lit glasshouse, plants reside in identical individual pots, moving gently around the huge space on whirring, clicking conveyor belts. Each pot contains a microchip which identifies its programmed needs. Each plant may have been designated for a personalised regime of water, fertiliser, pesticide. And each plant is daily monitored. As its progresses along the conveyor belt it pauses, turns to the left and passes into a chamber like a lift, whereupon the automatic doors close it from view. Inside it is rotated and photographed from four sides and above so that a computer programme can compute its precise enlargement since yesterday’s visit to the chamber. In another chamber it may be lifted out of its pot to measure the root growth under infra red light, or measured for fluorescence. Then the doors open and the belt moves on. Then there is a breathless pause. The plant pot stands upon a scale by which its weight indicates the amount of water it has lost or used since last it visited this point. The pause continues, the computer deliberates, and then according to its needs and the experimental programme, a downward angled gun delivers a precisely measured bolt of water to the roots. There is a further click and the patient moves on, to be followed by another and then another. There is a remarkable sense of suspense in watching a series of identical plants passing the weigh station, some to be rewarded with a drink of water, others assessed, measured and sent on their way thirsty. The multi-million pound National Plant Phenomics Centre opened very recently. It is a magnificent piece of sci-fi, with all the man-appeal of a train set. Quietly clicking and whirring belts drive continual motion, not a human in sight. Watch the You Tube animation here. 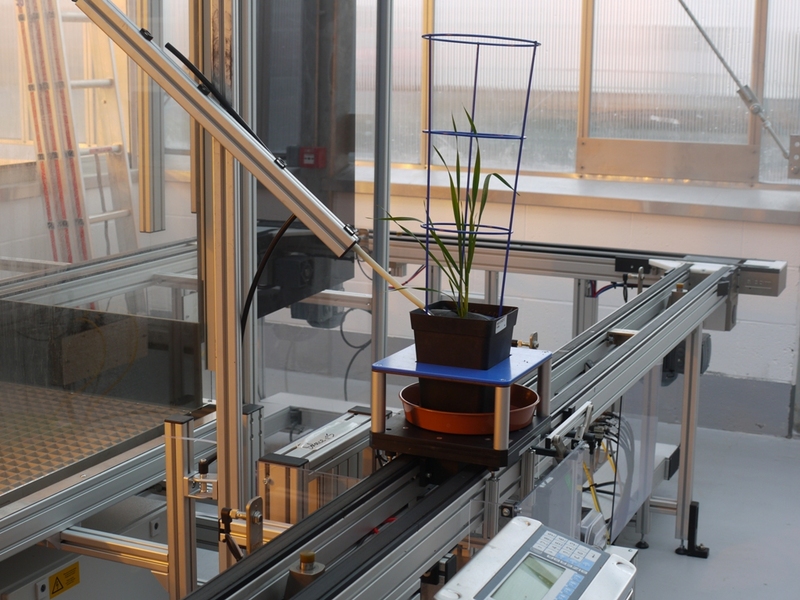 It looks as if fewer local jobs will arise from the National Plant Phenomic Centre than from the old techniques of watering cans and trial plots, for it is all controlled by computer from a single work station. In the animation you will find that the sole operative of the laboratory computer terminal looks suspiciously like superheroine Lara Croft. The film is accompanied by a mind numbingly repetitive electronic music sound track. Only in this respect does the animation exceed reality. Cunning techniques to sell a superfluous church? Walking along Queen’s Road these days one finds a strangely discordant sight, the 19th century Catholic Church, St Winefride’s, has suddenly found itself encased in security fencing and strident site warning signs. Which is odd because the building is pleasing to look upon, with well tended lawns and a pretty Presbytery House, occupied until just a few months ago, which is framed in roses and hydrangeas. It has always made an uplifting scene in this Conservation Area of Aberystwyth, the only building which is well set back, providing a green oasis of lawn. But all is not well in this idyllic spot, for the Catholic Bishop of Menevia is set upon dispensing with this church, much to the dismay of many of the parishioners, for whom it is of personal and cultural importance. That very lawn is perhaps the key to its undoing, for the site of house, church and garden would accommodate a lucrative development of flats – (what is described in the application as a ‘Quality Mixed Residential Development’). The Bishop plans to bring in the wrecking ball and demolish the lot. 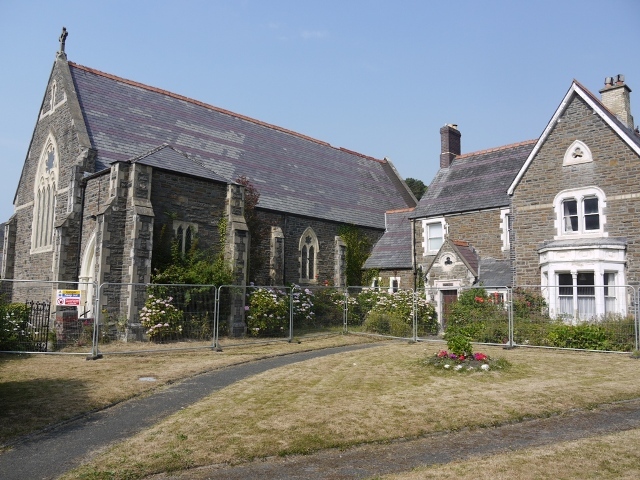 The Presbytery and its pretty garden will be neglected until demolition can be secured. The Council Planning Department however opposes the demolition of much-loved buildings in a Conservation Area, and the legislation suggests that before this course of action can be considered the owner must put the building up for sale to establish whether an alternative use can be found. And so it is shortly to be put up with a local Agent. Now, while most people trying to sell a slightly shabby but charming building would try to emphasise its best points, it seems the Church has other ideas. The security fencing is an eyesore, and erected as it is upon the lawn, the garden will soon be overgrown and ugly too. The best outcome from the Bishop’s point of view would be to demonstrate that no buyer will match their price, and then re-apply for demolition. The parishioners meanwhile have not been idling. 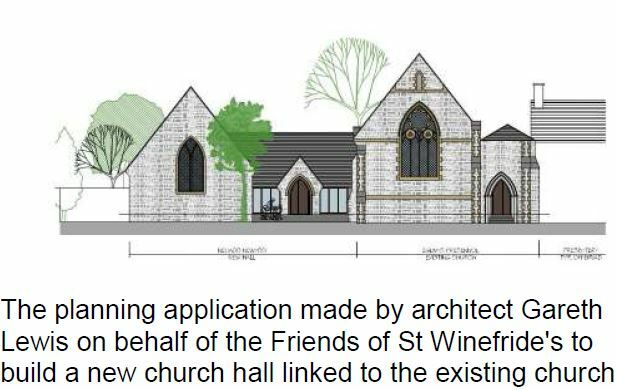 The Save St Winefride’s campaign has funded surveyors to consider the realistic costs of repairing a sound but somewhat elderly building, and have drawn up plans to renovate the buildings and build an additional Church Hall upon the site. This design is unpretentious, sympathetic, and has been granted Planning Permission by the County Council. The whole project would cost £1.2 million, far less than the £2.7 million estimated by the Bishop’s architects for their impossibly expensive version of the job. So why not accept the wishes of the congregation? 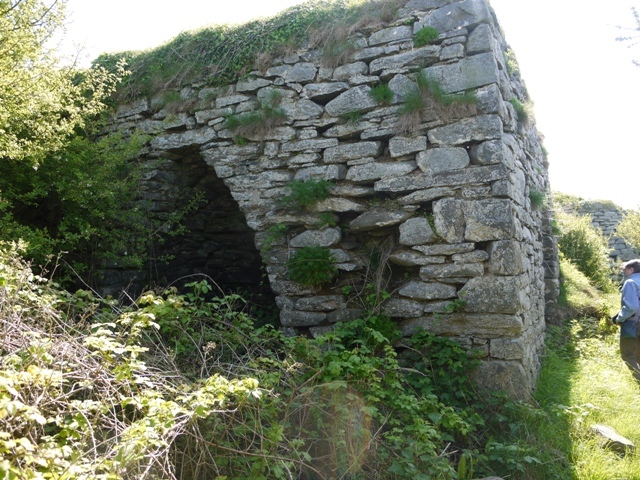 The Bishop has an alternative plan, first promoted in 2008, centred upon a little-known ruin two miles from the town centre in the suburb of Penparcau. 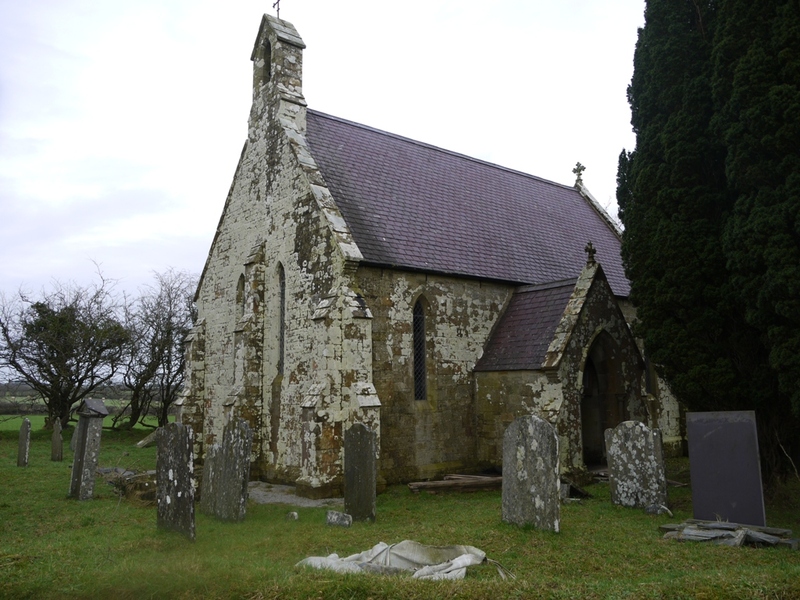 Here is another Church, the far more neglected Welsh Martyrs. A brutalist concrete structure from 1968, it has been closed for many years. Few people have even noticed it, for it is down a side road near the Tollgate public house. The new Pevsner described is as “an interesting design, let down by poor finish and detail”. The Bishop wants to pull that down too, and with more justification. 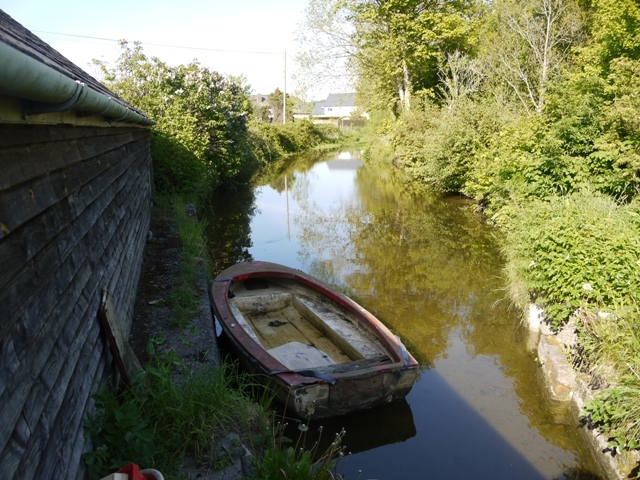 You could, alternatively, put a block of flats here, but Penparcau is not as sought-after as the town centre, the site is less valuable, and the profits would doubtless be less. 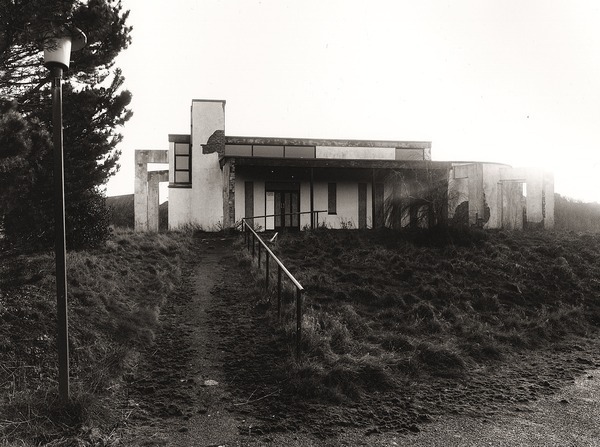 Instead, the vision is that Catholic worshippers from the town will take one of the rare Sunday buses out to Penparcau and walk down to a newly-built modernist building on the Welsh Martyrs site. It is hard to imagine that this will be a popular choice with worshippers. University students, who include many foreign Catholics will have a yet more daunting journey from their halls of residence on the opposing hill. Townsfolk who have been hatched, matched and dispatched at Queen’s Road for generations would like to go on doing so. The repercussions continue from a well organised parishioner and community action group which has become more active and vociferous as it has found its views to be ignored by the Church. There have been representations to the Vatican, consultations on Canon Law, opposing teams of surveyors and valuers, a sit-in in the church, an offer of resignation from the Board of Trustees by the incumbent priest. The Diocese of Menevia, though, is a vast catholic administrative region – stretching right down to Swansea. 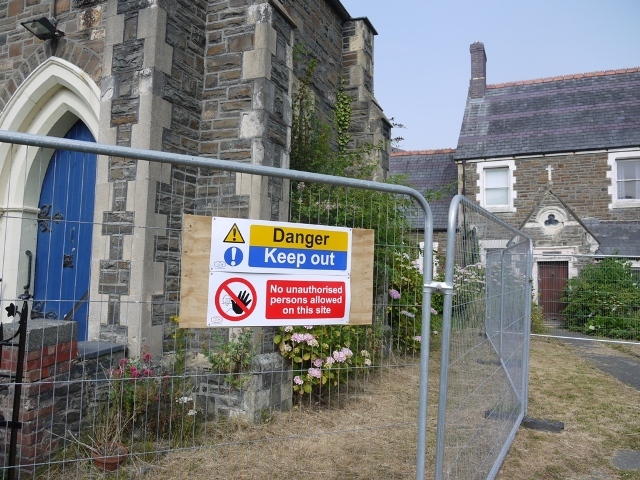 Angry Aberystwyth must seem very insignificant to a property-developer Bishop. For much more detail visit http://savestwinefrides.co.uk/home.html which gives links to a Dropbox bulging with damning evidence of manipulation behind the scenes. Last Saturday was not a day many people willingly ventured out. It was the third of three days on which a blisteringly cold wind from the Russian steppes seared its way across Ceredigion, and although unlike north and east Wales we had no snow, the chill factor made the eyes water and the marrow shrink. 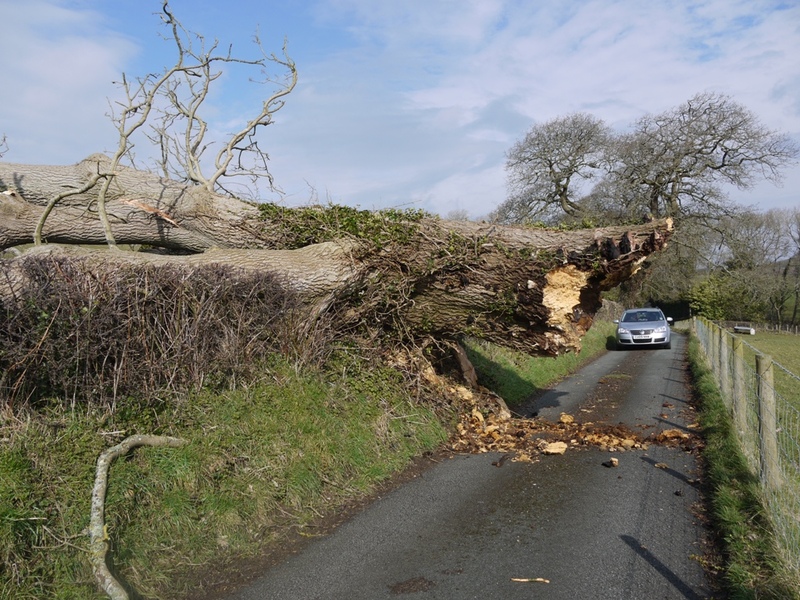 Setting out from our home we soon encountered our first obstacle a massive ash tree, fallen and pivoted on the hedge bank to block the road. When leafless trees fall it is a high wind indeed. Notwithstanding this, a small group of specialists converged from all over Wales to explore the building stones of south Ceredigion. 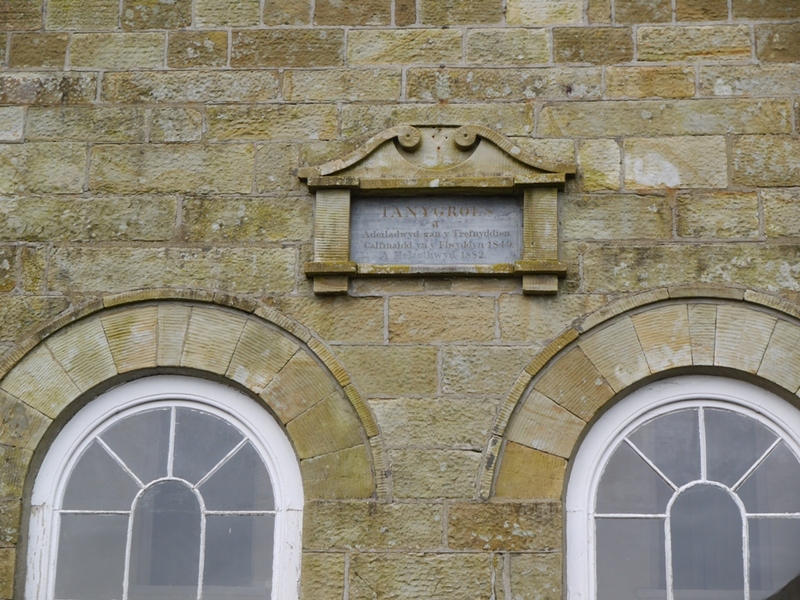 Our topic for the day was a locally occurring Ordovician sandstone, one form of which, Pwntan stone, has already been mentioned in this blog, as the stone from which Tremain Church is built. 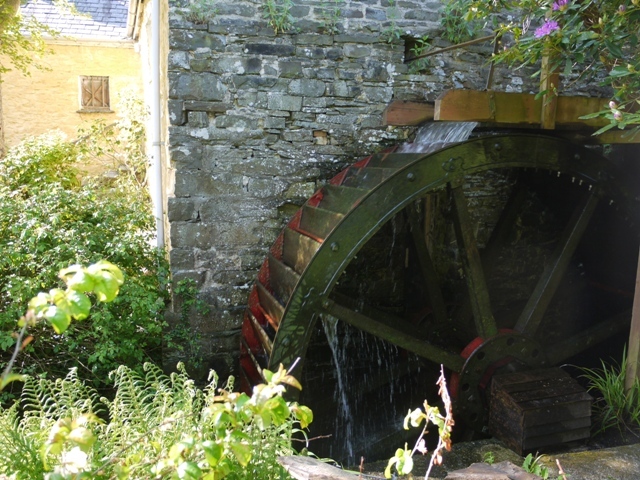 First we met at Tan y Groes. Here the main road is constricted by sandstone buildings on either side of the road, and speeding traffic roars through the gap. 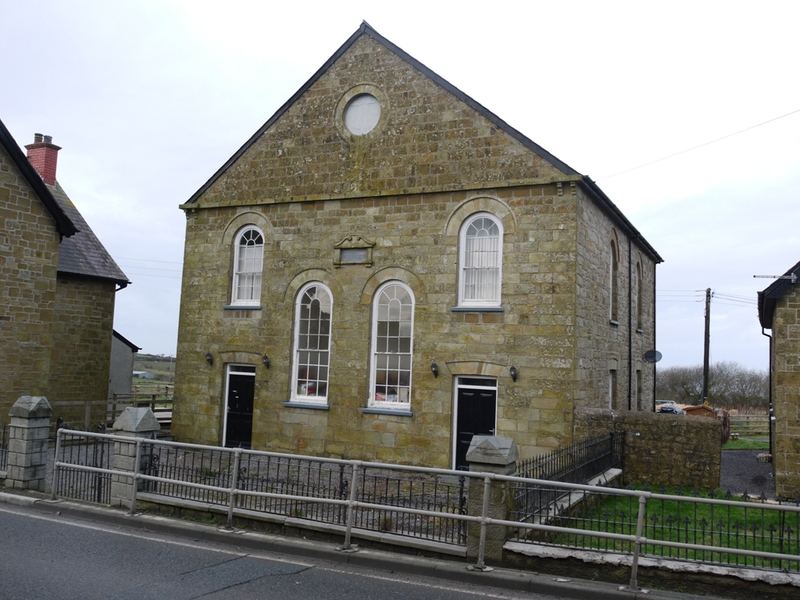 There is a Calvinistic Methodist chapel on the south side of the road with adjoining vestry building. Recently modified for residential use, the gable end facade has been recently cleaned by sandblasting. So many different styles of ornamental tooling can be seen. The main construction blocks have been pecked and pock marked with many short chisel blows. The edges of narrow ornamental dressings are transversely grooved, across the shorter axis of each stone. The voussoirs of the window arches are similarly ornamented and where large stone are used, a false division has been carved, to create the appearance of two or even three smaller voussoirs instead of a single block. 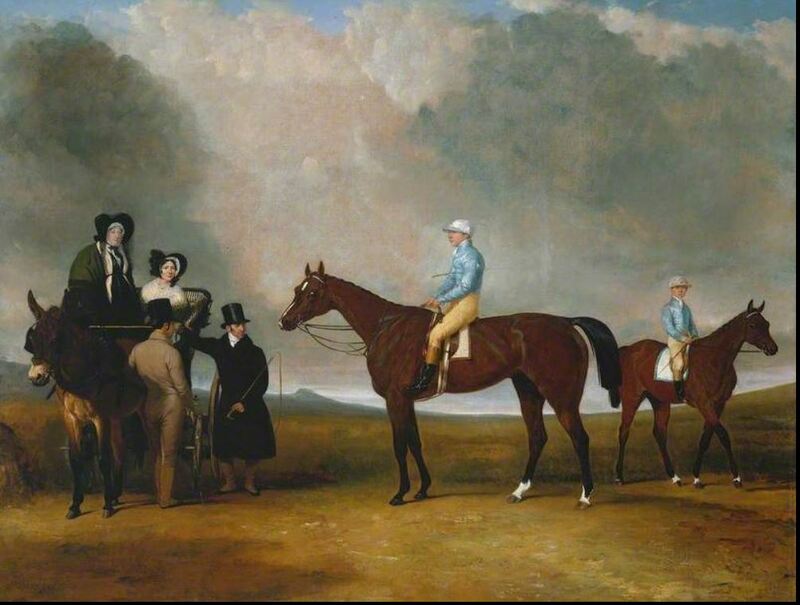 The building was commenced in 1849 a year after the completion of nearby Tremain. It is not known whether it is by the same mason, but it is certainly work by a meticulous craftsman. The characteristic interlocking stones of Tremain are not here however. Perhaps Calvinism is better represented by uncompromisingly coursed blocks. Other buildings in the village are yet plainer, built of rubbly blocks of sandstone. The chapel buildings could only have been created with hand-sawn stone. 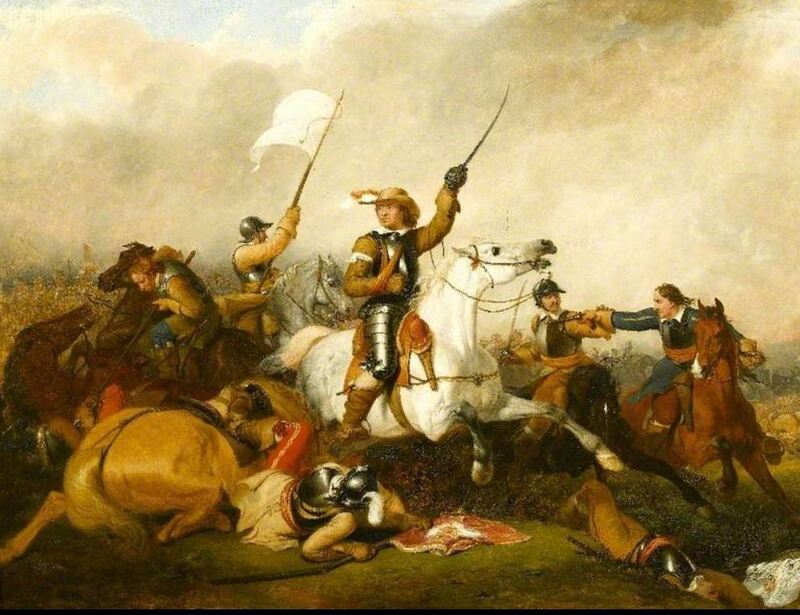 St Michael’s Tremain has already been described. It is the perfect habitat for the creamy white crustose lichen Ochrolechia parella. On the west end the lichen is so extensive that the building is almost white. 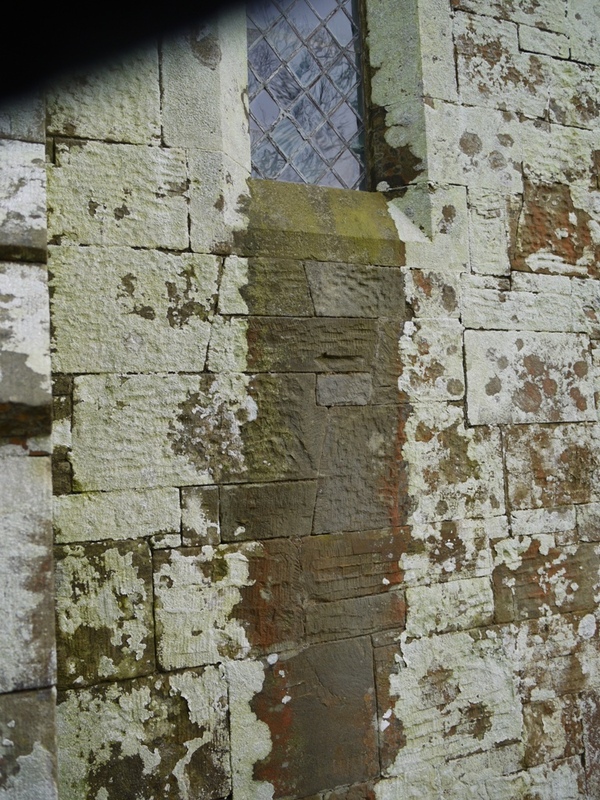 The toxicity of lead to lichens is nicely illustrated by the two strips of stonework below the lancet windows. When rain drives against the leaded windows and runs down to trickle off the sill it poisons the lichens and the stonework remains clean. 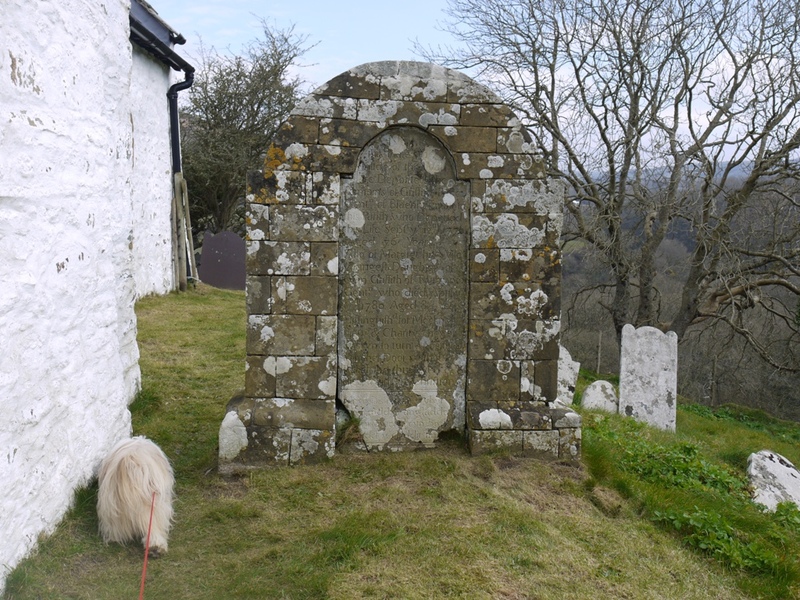 No such problems exist for the lichens in the churchyard at St Michael’s Penbryn. 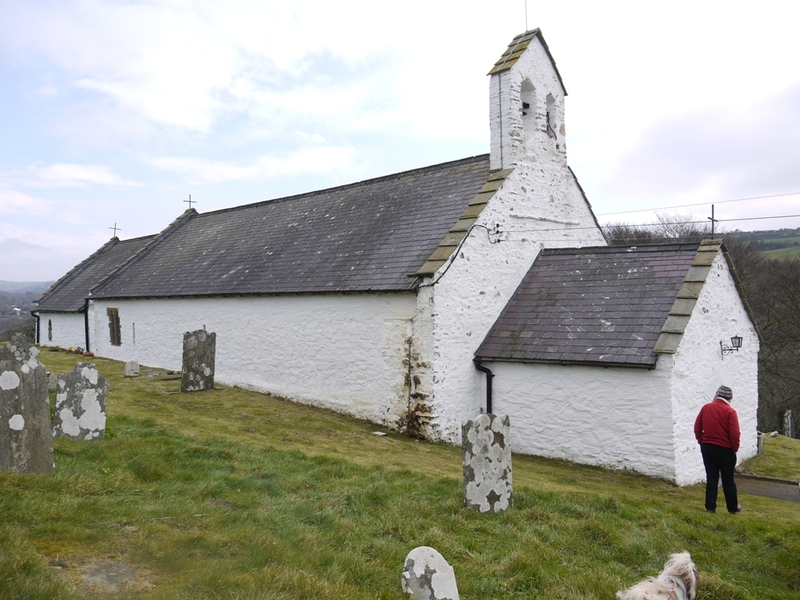 Here is a charming long low whitewashed church set in a circular graveyard on a hill above the sea. 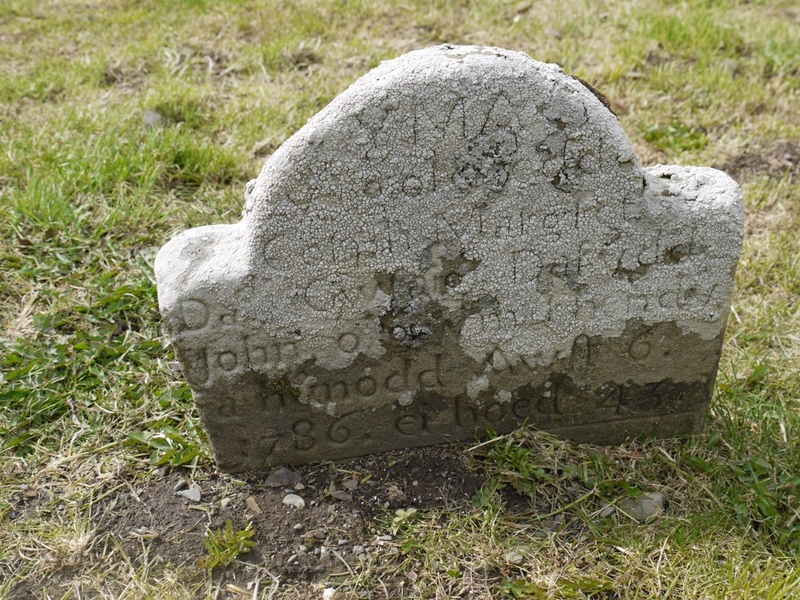 Here many of the 18th century stones are completely white with lichen, but remarkably the inscriptions can still be discerned because the lichen follows the carved indentations beneath. The stones have a characteristic shape curved at the top with square shoulders beneath. There are several grander graves in which the same round topped, shouldered shape is formed in cut blocks of pwntan stone framing an inscribed slab of slate or sandstone. They date from 1780-1820 and stand like theatrical doorways on the sloping plot. At first sight you might think them whitewashed, so extensive is the lichen cover. There are various places east of the main A487 where sandstone was formerly extracted but most are long neglected and overgrown. 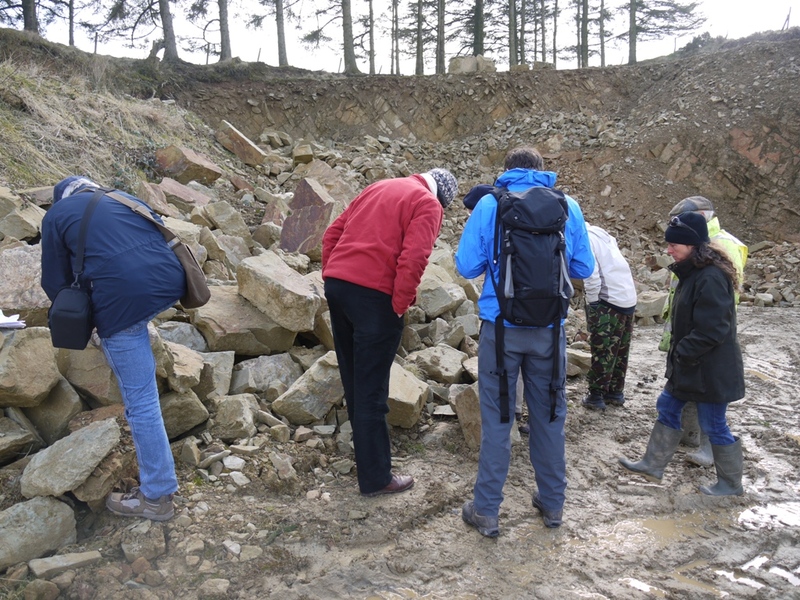 The group then went on to visit Gwarallt quarry, Bwlchyfadfa near Talgarreg where farmer Iwan Evans has had the initiative to re-open the quarry which supplied high quality sandstone in the 19th century. In a trade magazine of the 1880s it was vaunted as stronger, and cheaper, than Portland stone. 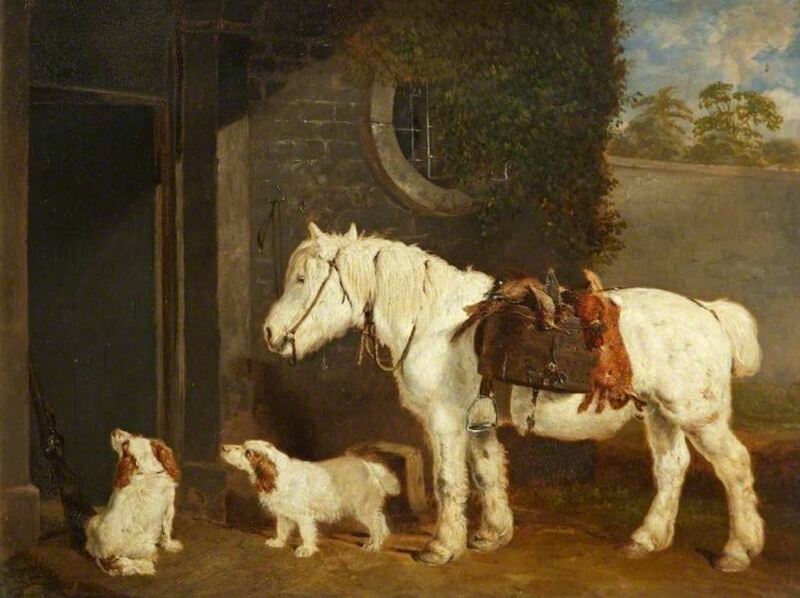 The stables at nearby Alltyrodin mansion were certainly built from Gwarallt stone, but whether it was exported over a larger area is lost to history. In the quarry one can see the thick beds of sandstone dipping down at 45° to the field above. Big blocky stones are quarried from the face and can be cut for paving slabs or shaped for modern stone building or restoration work. 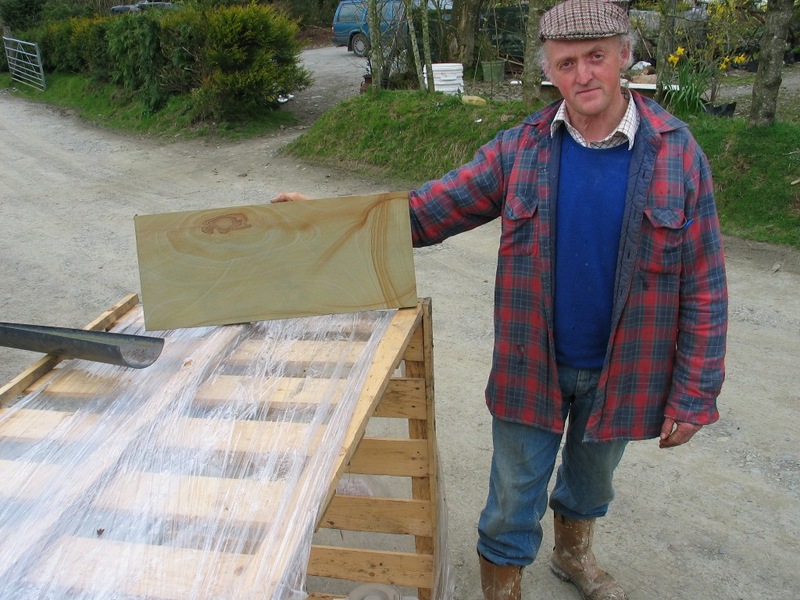 Some beds are too thick, yielding several-ton chunks too large for the saws on site. There are some monstrous blocks waiting by the road to catch the eye of a sculptor. Pwntan stone holds the sharp detail of its carving for hundreds of years. It would be a good choice for a new work of art. Not enough disability in Aberystwyth? 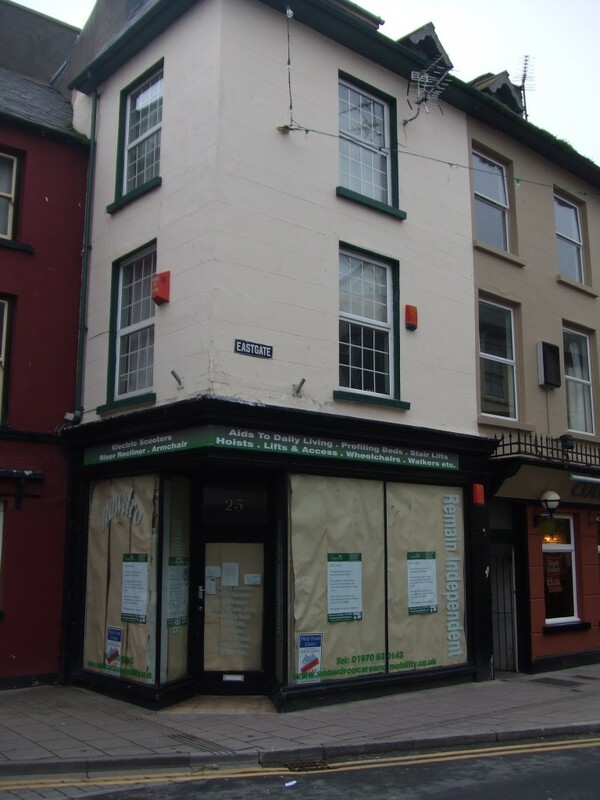 Another independent shop has closed its doors in Aberystwyth’s picturesque Eastgate Street. The windows, masked in brown paper give it a depressing air. However the message posted to the customers gives pause for thought, for it reads “ We would like to thank all our customers for their support and we are sorry there were not enough of you”. 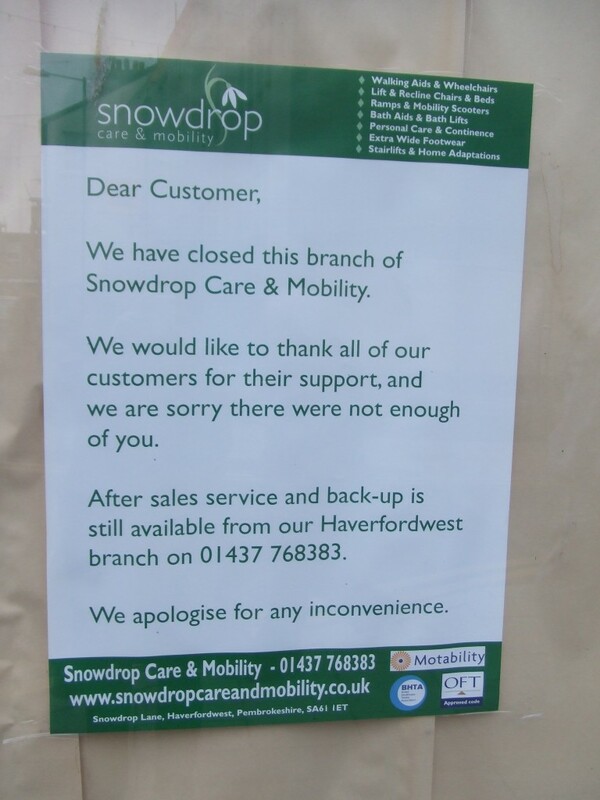 Snowdrop Care and Mobility sold walking aids and wheelchairs, lift-and-recline chairs and beds, mobility scooters, ramps, stair-lifts, continence aids and extra wide footwear for swollen feet. Not equipment many of us are eager to need. Can we conclude that Aberystwyth’s population is, in the main, ageing more healthily than the commercial predictions suggested? I hope so. Certainly there are plenty of the elderly out and about leading busy lives. Those less fortunate, it is implied (and I hope there are not too many of them) will have to shuffle off to Haverforwest ( a round trip of 125 miles). On the other hand they may resort, as we all increasingly do, to doing their shopping on the internet. I understand that an extensive range of this equipment can be obtained through Lloyds Pharmacy.